Throughout my life I have had fabulous mentors. They have touched my life in ways they will never know. I have thanked them as I have achieved goals and shared my success with them. Some of my mentors have been in my life for a very short period of time, and others have been in my life for 20 years. The best way that I can repay them is to be a mentor myself! I am in a place in my life right now that I can mentor others. I don't have a lot of free time, but I make time to mentor. I remember hearing long ago that sometimes the mentor receives more than they give and that has been my experience! There is so much joy that shows in someone's face when they have achieved a goal. The look of sheer joy is worth any time or effort I have put into mentoring! Have you considered being a mentor? Do not delay! Pick up the phone today and volunteer your time and your talents. There is someone out there who is looking for you to help them achieve their goals and share in the joy of their success! Be a mentor! Browsing through our members favorites, I came upon this shop in NotAPotato's favorite sellers. I had forgotten all about it! Last winter I ordered one for my son who is a web designer for a Christmas present. At that time she was marketing them as computer mobiles. I remember thinking that someday I wanted one myself. 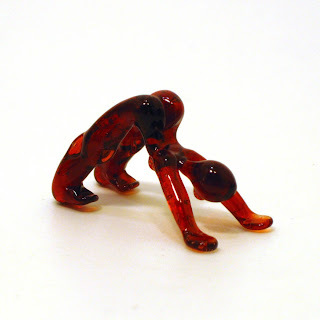 These glass yoga poses are something new she has created. Aren't they a hoot?! I am still trying to figure out how she actually made them. I could picture waking up to one on my kitchen window sill every morning as a reminder to not take life too seriously. If you have a Facebook (FB) page for your business, you might like to put a fancy button on your blog so people can pop over to your page and become a fan. There are 2 varieties: one is a small “Find Us On Facebook” button, and the other is a much larger badge that shows a couple recent posts and a random selection of fans’ avatars. When you're logged into FB and on your business page, click on "Edit Page." It's located right below your profile pic, top of the left column. Then look for the Communication section, towards the bottom of the righthand column. Click on "Promotion Guidelines." This page gives you all the information about how you can reference FB and link to them. About halfway down is the actual button, including a hi-resolution version. If you're posting it on your blog, you don't need the hi-res one... just right-click on the button and save it somewhere on your computer. (For blogger) If you're looking at your actual blog and you're signed in, click "Customize" at the top. If you're on the Dashboard, click "Layout." Then click "Add a Gadget" and select "Picture." You can enter a title and/or caption, or just leave it blank. Copy and paste the link to your FB business page into the "link" section. Upload the button picture from wherever you saved it on your computer. Click "save" and rearrange the gadgets so the button is where you want it in your layout. In 1892, Charlotte Mason founded her "House of Education" in England. Her belief was that children are thinking, feeling human beings, as spirits to be kindled and not as vessels to be filled. Her philosophy about raising and educating children is still alive today; and followed by many families around the world. In addition to her ideas about schooling, she also felt children needed plenty of leisure time. Leisure, to her, meant being outdoors playing, gardening, doing handicrafts, practicing an instrument, doing chores, cooking, visiting neighbors, or observing and recording the wonders of nature. - Something or someone to love (e.g., parents, sisters, brothers, friends, dog, cat, chickens, sheep, horse). 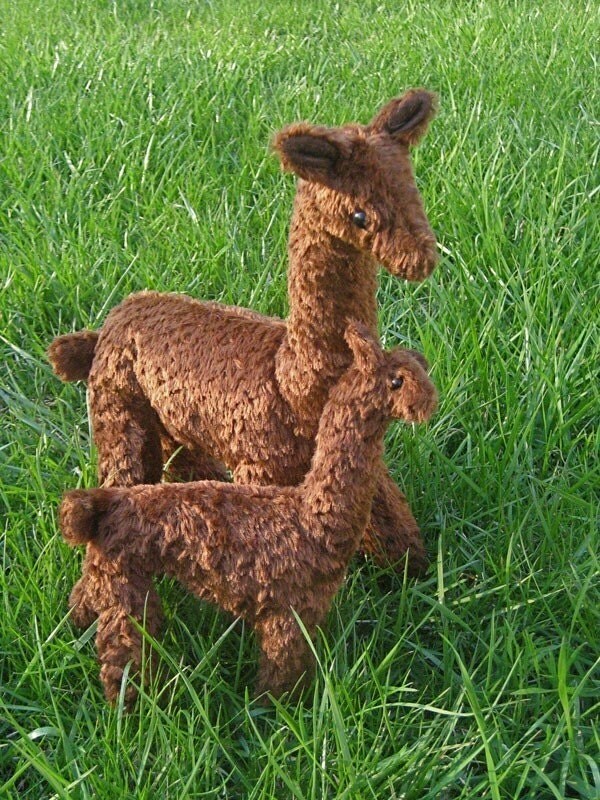 - Something to do (e.g., sew doll clothes, plant a garden, listen to someone read aloud, assemble a model). - Something to think about. According to The Charlotte Mason Companion, "It is enjoying other people's ideas, thoughts, and jokes, noticing the beauty in music or pictures, and enjoying country sights and sounds, birds, and flowers." I’m very pleased to announce the first HandmadeMN giveaway! We will be holding a new giveaway every couple weeks, so check back often. 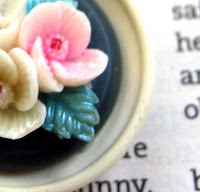 This week’s giveaway comes to you from Jodee of Palettepassion. Check out her shop for beautiful hand painted silk scarves and accessories! Jodee has donated a lovely silk and rayon blend scarf. It is hand painted with soft turquoise waves and beautiful purple flowers. Can't you just feel the silkiness of it? 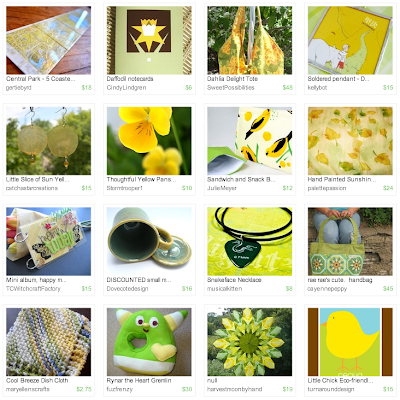 Visit Jodee's shop on Etsy, pick your favorite item and leave a comment on this post about it. (Scroll to bottom of post and click on Comments, or just click here.) Please make sure to include a way to contact you! Please leave each in a separate comment (To qualify for extra entries you must do step one above). 4. Follow our blog (you want to do this anyway to learn about upcoming giveaways!). Leave a comment here letting us know you are a follower. 5. Follow HandmadeMN on Twitter. Comment back here with your Twitter link. 6. 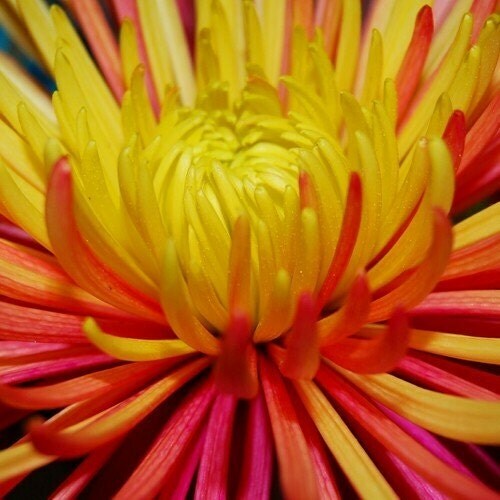 Become a Facebook fan. Comment back here with your Facebook name. Existing fans just leave your Facebook name here. Contest ends Saturday, August 8th at 12:00 noon Central. One winner will be chosen by Random.org. 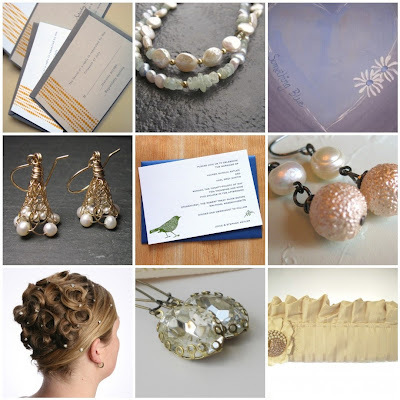 Meet HandmadeMN member Sara Werzel. Sara lives in White Bear Lake, MN with her husband. She's worked for the State of Minnesota for twenty-nine years. She says, "I came about my first State job quite by accident when I was very young and not concerned with things like insurance and a pension. Now I’m grateful I have those things." 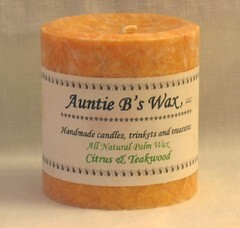 You can find Sara at her online shop Auntie B Online or one her blog Auntie B's Wax. I sell three different varieties of candles: 100% pure, solid beeswax pillars, all-natural palm wax pillars, and paraffin pillars. I also sell accessories made from bottle caps: magnets, drink charms, and pins. The shop candle offerings are less during the summer months as too many people believe in the myth that candles are only for winter and the holidays. I do, however, have a wide variety of summertime candles in fresh scents and bright colors that sell wonderfully at craft and art shows. 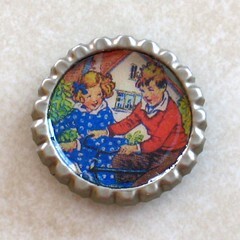 The bottle cap charms, magnets, and pins are popular items. 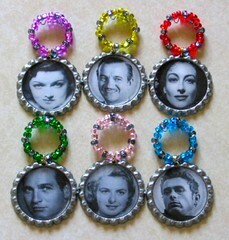 Besides what I offer in my shop I also take custom orders, which keeps me most busy. While I can’t live without my modern conveniences (although I still don’t own a microwave) I find myself fantasizing about simpler times – times when I was a kid and times of generations before me. I think people respond strongly to things that spark memories of those same simpler times. 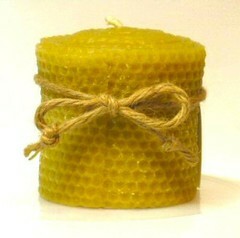 Candles, especially the beeswax, represent a time when candles were a necessity rather than a cute home accessory. In my all-natural palm wax and paraffin candles I choose scents to stimulate happy memories. The floral scents in your mom’s garden, the butter and sugar fragrances coming from your grandma’s kitchen, the spicy and fruity aromas of Christmases past are just a few ways to tug at memories through the sense of smell. My bottle cap items stimulate memories visually. The magnets and pins have fun images from times gone by, and many of the drink charms come in sets with images of old movies, retro TV, and pulp fiction. I do my candle pouring in the lower level of the house. More specifically, the basement. It is perfect for the cooling process. The bottle cap production is done all over the place. I prepare the caps in my basement studio, glue and resin the images in the dinette area, and I bead the charms in the rumpus room. My husband has learned to tolerate the presence of my products wherever he turns. I think everyone starts crafting at a very early age. Remember macaroni art and woven pot holders? We all did arts and crafts as small children. I began making things seriously about twelve years ago when I first got married. I made everything from rolled beeswax candles to dried apple wreaths. 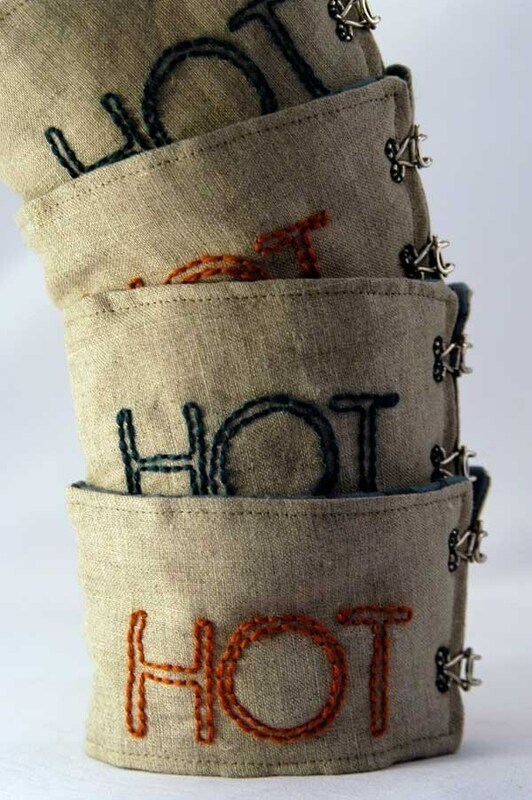 I have an interest in learning to sew better. There are so many cool fabrics out there and I often wonder, “what could I make with that?” I also dabble in paper crafts, note cards and magnetic note pads. When I peruse the internet and see a tutorial that interests me I pretty much have to try it, or at least put it in my Things-To-Make file. My candle supplies come from a variety of suppliers, scents and here, wax there, molds somewhere else again. I buy bottle caps at a local home brewing store in the Twin Cities. The beads for my bottle cap drink charms come from Storm Cloud on Snelling Avenue in St. Paul . They’re wonderful! Of course for general craft supplies I visit Michael’s. They’re 40% off coupons are invaluable! I have my shop URL listed on my business card. I do a number of craft and art shows throughout the year and many of these cards are taken by customers and potential customers. I’ve also started getting involved with Facebook and Twitter. Networking and testimonials from customers are the good ways to get a name out. 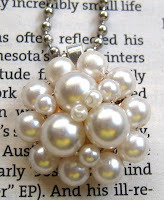 If you are a member of HandmadeMN & would like to be featured in Eight Questions email me at katbaro at yahoo dot com. So you want to start selling at shows? 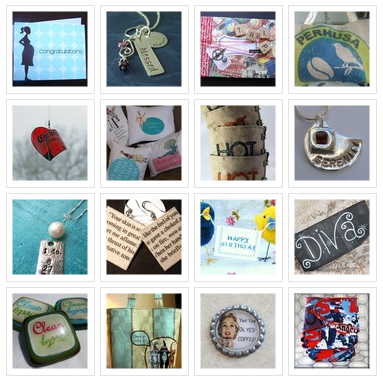 So you think you'd like to start selling your handmade items at shows? Where do you begin? Unfortunately, the answer is different for each person and the items you make. Let's start with choosing a show. I find the Midwest Art Fairs publication invaluable as it lists over 1200 art and craft fairs and festivals across the Midwest. This publication is available online or at many art or craft suppliers. Organizers of events submit information about their event including anticipated attendance, costs and the process to apply to participate. One of the most important decisions, is what type of event is most appropriate to your items and market. 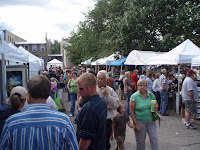 I divide shows into three different and distinct categories; boutiques, craft fairs and art festivals. Here is where you need to make some of your decision based on the type of handmade items you have. Generally, a boutique has some handmade items and some direct sale items (like Pampered Chef or Mary Kay). Where as, craft fairs and art festivals have mostly handmade items. 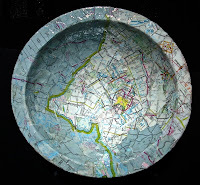 Again, the Midwest Art Fair publication will indicate if the event is all handmade or can be direct sales. Will your product fit well or be similar to the market at one type of event better than others? 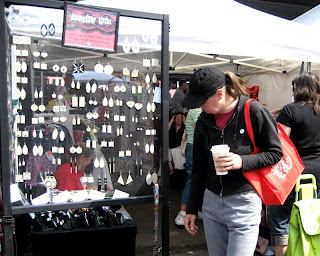 Lots of crafters do well at boutiques and craft fairs but not at art festivals or vice versa. I'm sure there is some marketing guru science to it, but I think it's really about what people go to these shows to find. 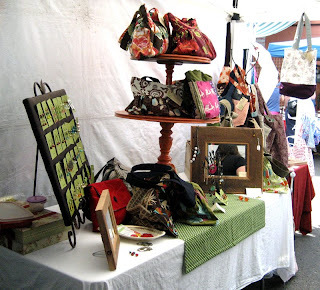 What's your market and do customers in that market go to more boutiques, craft fairs or art festivals? After identifying the appropriate market for your products, and deciding on a show(s) you'd like to try, talk to others who may have done this show in the past and see what they thought. Go beyond the general question of "was it a good show?" If it wasn't good for them, ask why? What products do they sell? Maybe it wasn't the appropriate market for them and that's why they didn't do well or maybe there was bad weather. Lastly, if you are considering a show for next year, go there this year and check the attendance. Do you see people carrying bags of purchases? Are there lots of people selling the items you also make? Because I sell many $50 - $100 items, I prefer art festivals where other vendors also have items in that price range so the event generally attracts people who expect to spend that amount on an item they are purchasing. Some of my favorite and most successful events include Lanesboro Art in The Park, Zumbrota's Art in East Park, Eagan's Art Festival and Northfield's Riverfront Art Festival. Good luck on your decision to sell your products at shows. A future post will included how to have a successful show once you've made the decision where to participate. 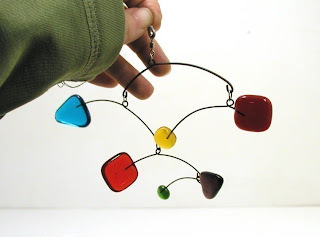 Congratulations to Monique of Glass Garden Designs for winning June's HandmadeMN monthly challenge! Thanks to all who participated in this month's challenge, and stay tuned for some great "Circus" entries in the July challenge! 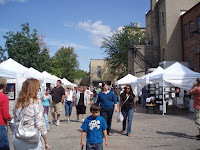 The HandmadeMN team will be at the Minneapolis Farmer’s Market Annex most Saturdays this summer. Each week, several team members will be sharing a single booth, to give you more opportunities to purchase handmade! 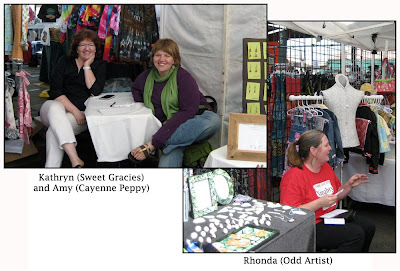 A recent weekend found Amy of CayennePeppy, Kathryn of SweetGracies and Rhonda of OddArtist, sharing the booth. 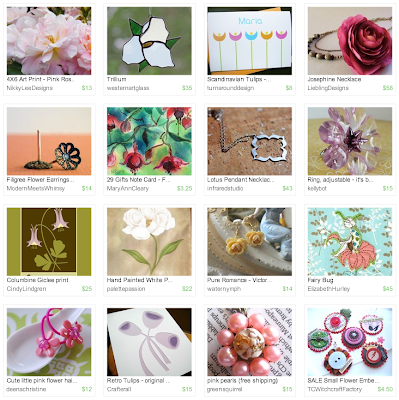 Check out their awesome handmade goodies. 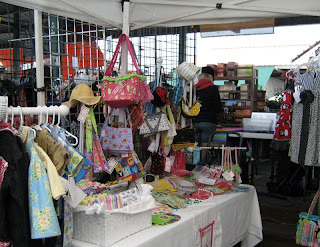 Don't forget to look for our booth next time you are at the market! 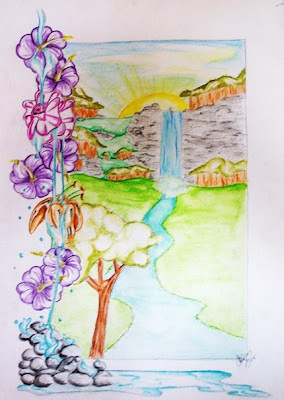 I've always been envious of people who can draw and paint. Oh, I can paint things, like a wall or a door, and can draw stick figures, but sketch and paint works of art? Not me. 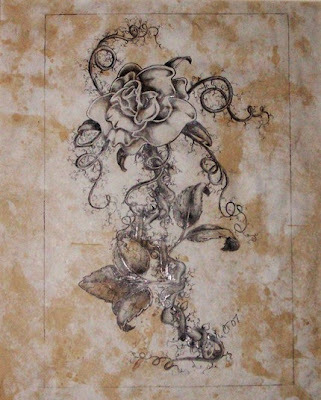 Applying a medium to paper and creating an image is a talent, to be sure. Charles Tichy has that talent. 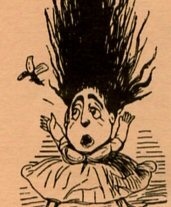 My fascination with Charles' work began with the above image, which unfortunately is no longer available in his shop. The softness of it has such a dreamy feel, and I love the natural earth tones. Again Charles displays a soft, calming effect. This work of art would be a great piece for meditation, to stare deeply into it and in your mind travel to the place Charles sees. 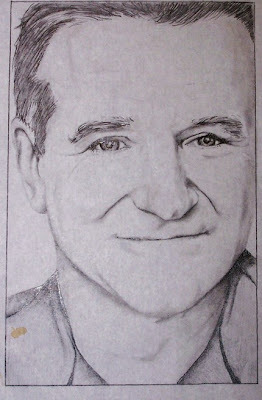 Not only does the artist create still lifes and landscapes, he does an outstanding job on portraits. I am amazed at the likeness he achieves in his celebrity portraits. According to his shop announcement he is happy to do custom work from photographs. Simply amazing. 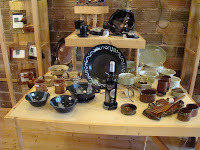 Stop by Chazzt82 and see what Charles has to offer, or better yet, have him create something especially for you. Last month I wrote a brief article about writing a business plan. After I wrote that article I thought about the process of finding a niche. I have read many times that you should do what you love. I agree with this premise, but is this truly the path you should follow? Is this the path to follow for finding your niche? Sometimes we put the cart in front of the horse. We look at what we love to do and what we have a passion for! Sounds good so far, but is there truly a niche for what we want to do? 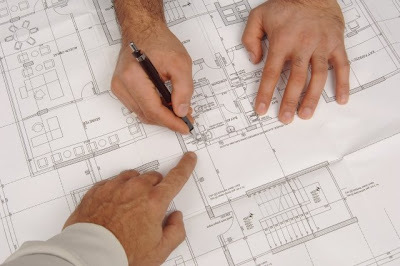 Or, do we need to modify our plan? That is where the Small Business Administration can help you. Writing a business plan is a work in process. Finding your niche is a great way to start the process! 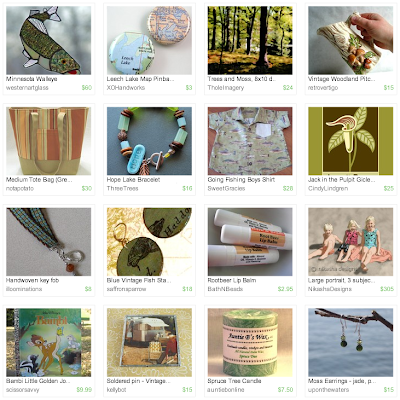 Welcome to St. Paul, Minnesota, home to Lisa Finger and the jewelry shop The Green Squirrel. 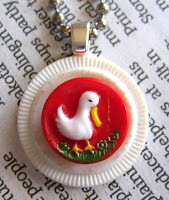 Housed in a 12 x 12 craft room, Lisa is busy at work creating pendants from buttons and button covers. After scouring estate and garage sales and armed with her library card and her laptop, Lisa finds all the inspiration she needs to keep motivated. Extra storage in her guest futon aside from her desk and book shelves amidst her husbands clothing closet help keep The Green Squirrel organized to create her treasures. Lisa does her best to work when she can during the week, but primarily sets up camp in her creative space on the weekends. 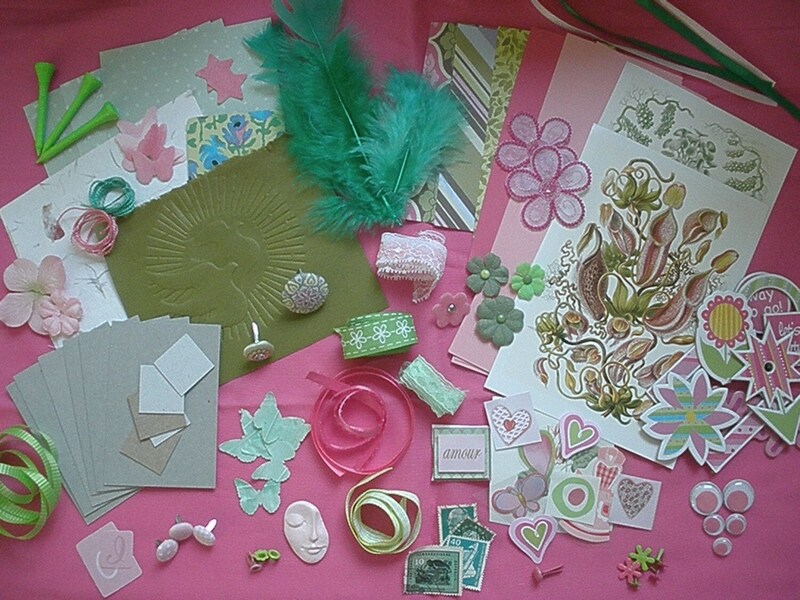 “I have a heck of a lot more supplies for crafting than I would like to admit,” she says. Her button pendants, cross stitch, and knitting projects are all tucked cozily with her in her craft space. “I love the windows to our large back yard, the futon for when I get sleepy, and the fact that it's the warmest room in our house!” she says. Every space has its ups and downs, but any space with room for a good nap is perfect! 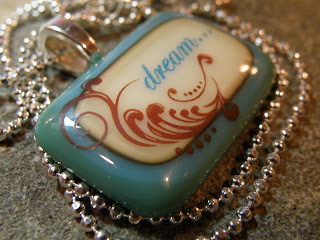 What a great way to keep up that motivation for her beautiful pendant creations! This week as I made up a few pendants, I needed a way of adding a cord. I looked at putting on sterling silver end caps and then a sterling silver clasp, but the cost seemed high for what I was trying to do. I wanted to use a rattail cord or some high quality leather. 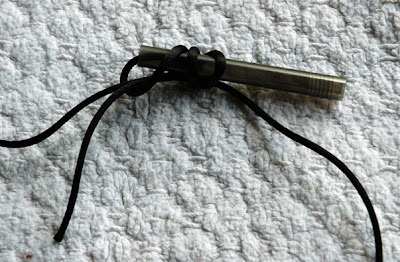 How about a sliding knot? After making one, I realized that these would be a nice and simple touch. The length could easily be adjusted for the wearer, and there were no weird maneuvers needed to put the clasp together when putting on the pendant. Just pull apart, slip over one's head and adjust the length. I used part of an old ball point pen, but a straw would work well, too. 1. Overlap ends. 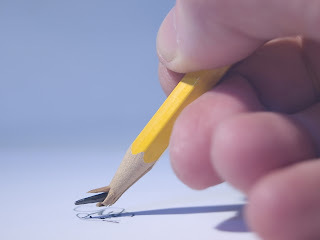 Lay the empty pen cylinder above the overlapped ends and drop one end across the cylinder. This will be the working end. 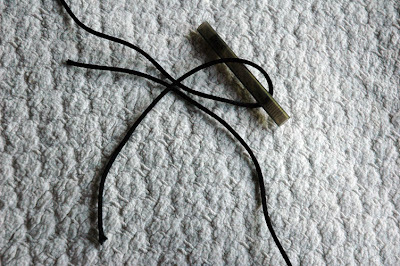 Wrap this end around the cord and cylinder three times. 2. Insert the working end into the empty cylinder. 3. 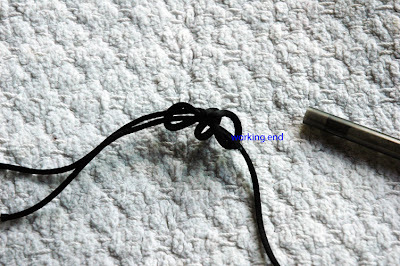 Pull out the cylinder with the working end cord coming along with it. 4. Pull tight, adjusting as you go. 5. 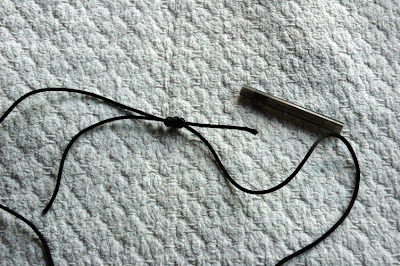 A finished sliding knot. Recently, I decided to participate in the Summer Biz Sessions, presented by IndieBizChicks.com. The Sessions are a series of conference calls were guest speakers present a variety of topics focused on Indie businesses followed by a question and answer segment. This week’s presenter was Jenny Hart, founder of Sublime Stitching. Jenny spoke about her experiences navigating the world of publishing on her road to having books featuring her embroidery designs published. While I’m not necessary exploring publishing anything right now, Jenny was a very interesting speaker and seemed very knowledgeable on how to have books published through a variety of different methods. If you are interested in participating in these sessions, they are quite affordable. If not, at least check out the IndieBizChicks web site, it is a great resource for your indie business. Isn't this the coolest coffee table?! Chrystie from NotAPotato has this shop as one of her favorites. It's a bummer that the seller, Bombus, is located in the UK. 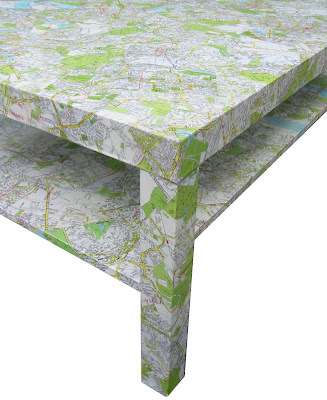 I need a coffee table for our family room, and I thought how neat it would be to decoupage one with maps of of places we have been and lived. It could even be places where we want to go! 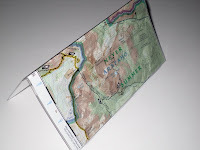 That got me doing an Etsy "map" search. There are really neat map things out there. I wish I would have thought of it earlier, because some of them would have been great graduation gifts. 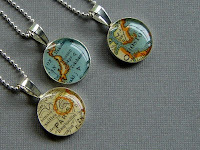 I have always admired XOHandwork's map pendants. 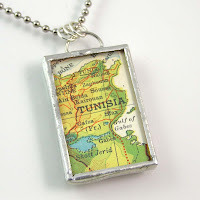 My thoughts about travel places for the coffee table led me to think of how neat it would be to have a travel charm bracelet of places you have been. 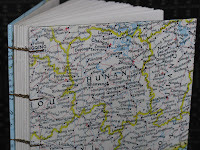 For kids going off the college, something with a map on it of their hometown could be really special. (Whether they admit it or not, I think most get a little homesick.) I also know of some friends who have sent packages to their kids at school over finals week to give them a boost. 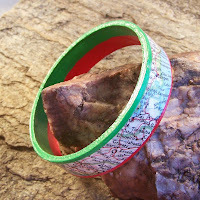 The map magnets, buttons, or pendants are relatively inexpensive and would be easy to mail. 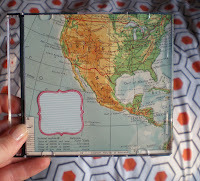 Store the CD of your summer vacation pictures in a custom CD case from russianforest. Travelers? A journals would be awesome for any age. 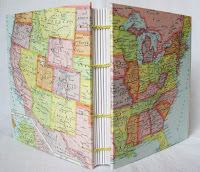 The one with a US map on it from PrairiePeasant reminds me of a book I had as a child, where you could circle the states you had visited. 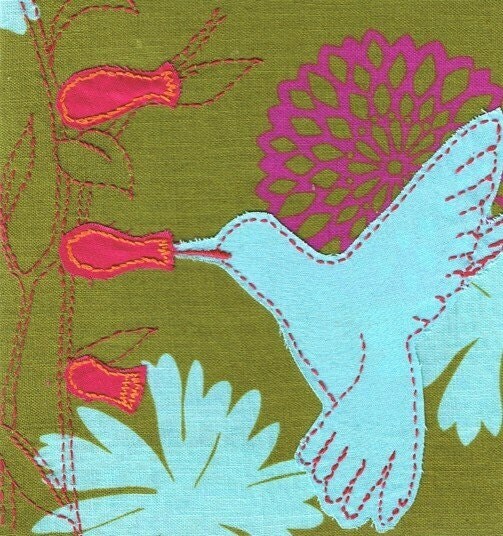 I pictured a checkbook cover above from tatteredtapestry, but they also have passport covers. 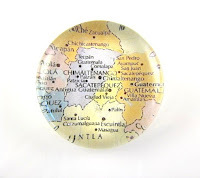 The Glass Map Magnet of Guatemala comes from the DosBesitos shop. DosBesitos specializes in adoption related pendants, paperweights, and magnets specific to different countries and languages throughout the world. This is a beautiful little shop! My parents lived in China for a time, and I kept all my mom's email correspondences to me. I am going to ask kristincrane if she will make a journal for me to put the printed emails in. 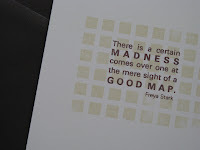 I am sure that many of these Etsy sellers would be willing to custom make something with a specific map on it. Don't forget these great "Happy Travel Cards" from kristencrane!